The financial strength of your urology practice is directly correlated to timely billing and account reimbursement. We have years of experience providing urology billing services. Hiring a quality billing service is one of the most important decisions you'll ever make regarding the business aspect of your practice. It is crucial that your urology billing company have the experience necessary to handle the complexities presented by urology billing and modifiers. Why not allow 5 Star to give you the financial peace of mind you deserve? Please visit our homepage to obtain additional information regarding our services, references and other pertinent details regarding our urology billing services. According to the American Association for Accreditation of Ambulatory Surgery Facilities' Guide for Third Party Reimbursement of Facility Fees, the urology specialty tends to perform poorly when it comes to receiving reimbursements. However, this is not true for all urologists. In fact, providers who work with experienced urology billing services often receive higher reimbursements on average than those who do not. This is due to the fact that billing services are well-equipped to meet the unique needs of urology practices. At 5 Star Billing services, our certified coders and billers understand the correct procedures and processes required to receive maximum reimbursement. For procedures that are complicated to code and bill for, we communicate with providers and office staff to ensure that billing errors and common coding mistakes are avoided. This makes it possible for us to submit claims correctly the first time for speedier, on-time reimbursement. Our certified coders have years of experience working with urology practices and are equipped with the knowledge to handle coding and billing-related processes to ensure that you receive payments and reimbursements on time. Our extensive knowledge in the urology field has allowed our billers and coders to meet the demands of a wide variety of urology providers, clinics, diagnostic centers, hospitals, and multi-specialty groups. We work side by side with your practice to help identify problem areas and establish the best medical billing and coding procedures possible. Our urology billing service is based in the United States and is fully compliant with HIPAA standards and regulations. This means that your patients’ protected health information will never be compromised. Our billing and coding employees are well-trained and keep up to date on the latest changes in urology codes and payer requirements. This ensures that the claims we submit are accurate and do not delay payment. We also understand the claims denial process and can appeal denied claims quickly and efficiently to ensure speedy reimbursement. Coding for catheterizations can be confusing due to the fact that how you bill a catheterization depends on the clinical scenario. Therefore, before assigning codes, we verify the exact procedure that was performed in order to prevent the claim from getting denied. For example, for urethral dilation, which is one of the most commonly performed medical treatments at urology practices, our coders know to assign CPT codes for initial and subsequent dilations. This way, the urologist is reimbursed fully for the services rendered - and no money is left on the table. A urology billing company should increase your reimbursements. In fact, it should be more efficient and effective at billing than your own office. A urology billing company should let you and your personnel focus on practicing medicine. Whether you own a private practice or work in a hospital or multi-provider facility, a urology billing service can make your practice more profitable. According to industry experts, a claims adjustment rate of between 20% and 35% is considered good and acceptable. At 5 Star, our account executives have an average of eight years in urology billing. Their knowledge, ability, and dedicated follow-up is why our adjustment rate is consistently lower - as low as 12% with Medicare. At 5 Star, we achieve AR rates for our practices that are higher than the industry average. Simply put, you and your practice will get a higher average return per processed claim. 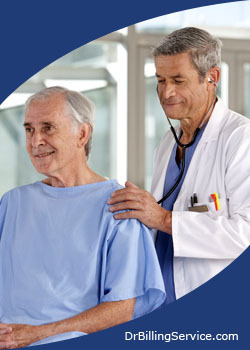 5 Star Billing Services is unique in the field of urology billing. We offer a complete business solution to your medical billing and practice management needs, and we do it all for one fee. All the medical billing services and benefits you receive are included, even your overnight mail for shipping your demographics.